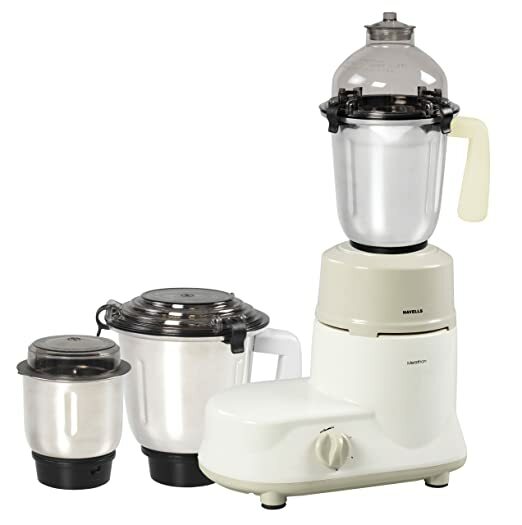 Havells Marathon 750 Watt White Mixer Grinder is featured with 3 speed control and pulse function. It has 3 hygienic stainless steel jars with hard chrome blades. It has liquidizing jar 1.5 L, Dry- wet grinding jar 1.0 L, Chutney Jar 0.5 L and Vaccum feet for stability. 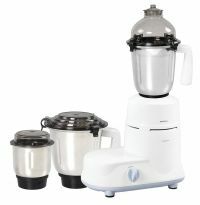 Havells Marathon White Mixer Grinder also has ABS body and jar handles, ABS dome lock lids for extra safety, Flow breakers in jars for better performance, Built in over load protector for motor safety and Brake resistant poly carbonate jar dome cover and lid. To Recieve updates and possible rewards for Havells Marathon Ivory please sign in. To Recieve updates and possible rewards for Juicer Mixer Grinder (JMG) please sign in.